Most aerobic species of bacteria (those that can grow in the ambient 20% O2 found in earth's atmosphere), will grow on one or more of the media types below. 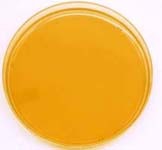 Solid media commonly contain 1.5% agar per weight to solidify the liquid, nutrient part of the media. After sterilization, the liquid media is poured into sterile Petrie plates - think of it along the lines of pouring heated jellow into small cylindrical molds.. Petrie plates are commonly made of plastic, and can be purchased already sterlilzed with 25 or more per package. 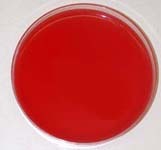 Uses: Very enriched media with lysed red cells, to release many nutrients needed by *fastidious* organisms. It may look like chocolate, but would have a rather nasty flavor, like coagulated blood-flavored jello.. 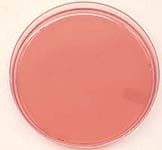 Uses: Selective media for Gram-negative enteric bacteria (higher bile salt concentrations than MacConkey). Distribute 5-10mL into glass tubes with autoclavable tops. Autoclave 30 minutes, OR place in a pressure cooker for ~45 minutes @ 15 pounds pressure. Same as for LB-broth, but add 15g of agar prior to autoclaving. 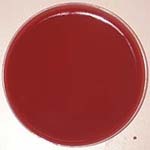 Be certain to mix thoroughly prior to pouring media into Petrie plates. "pinch" or small amount of 1mg/mL Bromcresol purple or Crystal violet solution. Tryptose Soy nutrient agar base (contains agar in it). Recipe: Recommend commerically produced media. Recipe: Recommend commercially produced media. If bought in powder form, must heat over heating plate prior to pouring plates. Do not autoclave.